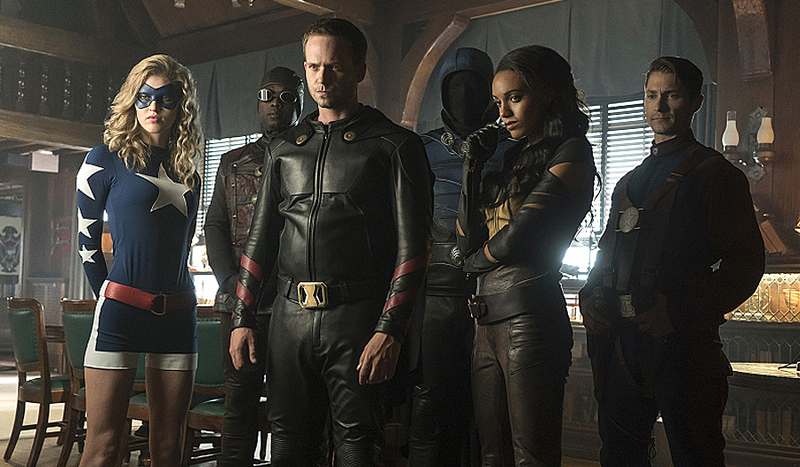 CW has released the first photos for DC’s Legends of Tomorrow Episode 2 which feature the first look at their version of the Justice Society of America!. Among its members are Stargirl, Dr. Mid-Nite, Hourman, Obsidian, Vixen, and Commander Steel. My first reaction is, "Oh dear me... what have they done!" and "Is this for real! Seriously, is this the best the 'CW' can do? and I have to ask... is that a swimming cap Dr Mid-Nite is wearing? I had my reservations when we had a quick peak at Hourman at the end of last season and my initial thought then was, "What the Hell! ", but seeing all of them together is, what can only be described as a 'Joke'... I've seen cosplayers do these characters better 'Justice'! The only one I can say that looks anything like what she should do is 'Stargirl' and she's pretty bad. How can one person out of a whole team of characters be the only one not to wear leather, she looks so out of place! Mind you I was never a big fan of the Stargirl character, always thought she looked uneasy carrying that blood big staff of hers around every where she goes. Considering the JSA was once portrayed in the Smallville series a fair few years ago, (which I actually think who ever did the costume design for them did pretty well, maybe not Hawkman's chest plate so much and definitely not his wings) you would think that the Series producers of Legends would make a comparison and say to themselves, we have to better this... well, if you did... then you've horrendously failed! Let's break this down shall we. I'll deal with Hourman first as he's the first JSA member we're introduced to at the end of last season. This is the Rex Tyler version of the hero, from the WWII years. Question... Where is the classic Yellow? I understand the producers want to follow the dark theme like every other Superhero representation of today and that the producers probably see the Yellow as cheesy, but come on guys, the Yellow is his signature colour just like the Red and Blue is for Superman! We've already seen the hood, but it's just a hood! Why doesn't the hood include the mask? What I definiately can't accept is the cape they've given him, if that's what you want to call it. Look on the main picture at the top of this article, it ends just below his hands, what's the point! It looks like some thing a child would wear. The only thing I can see that the costume designers have used from the source material is the red stripes on his cuffs. To be honest he's virtually unrecognisable from the comics! Total waste of time! Where do I begin with Dr Mid-Nite? An 'old school' hero that in my opinion is one of the best and the designers do this to him. Check out the pic above, two classic images either side of what can only be described as a compete mess in the middle - I just don't get it ... how can anyone believe that this is a good representation of the same character ... for 'gods sake' is that a 'swimming cap' on his head, where's his hood ... HOOD, he wears a HOOD or cowl! And the googles, not only have they given him a 'swimming cap', but they've also given him the 'swimming goggles' to match! How difficult would it have been to have decked him out in a pair of goggles from a WWII fighter pilot , they are based in the same period! I couldn't be more INFURIATED! It's an insult to DC Comics and the creators of the character! Even the 'crescent moons' are the wrong way around. Where's his green cape? His tunic is supposed to be red, not everything else! And the Cowl or Hood is supposed to be attached to the cape, creating the same effect as Batman. As with Hourman I can only see ONE thing that looks correct and that's his gloves! Can you actually believe what your looking at in the image above! On the left and right you have the actual character taken from the pages of the comics, Henry Heywood, AKA Commander Steel! I own the first comic he appeared in "Steel, The Indestructible Man" from Captain Americas writer Gerry Conway and Artist, Don Heck from March 1978, I was an immediate fan. I'm not exactualy sure WHAT we have in the middle image... but THAT is supposed to be the TV series representation of the same person. I wasn't expecting an actual recreation of the same uniform but this is just a JOKE... can this actor actually walk, let alone act with all that army webbing he's wearing? I spot one thing that relates to the pages of the comics and that's the star in the centre. Unless we are led to believe that all that unnecessary and stupid webbing is supposed to mirror the design of the costume. Heads up costume designers... IT DOESN'T! And where on earth is his mask? Oh, sorry... TV Series producers don't like masks do they? I can only hope that the producers aim to give his Grandson a better costume! Other than the designers have at least tried to make a loose representation of the character and failed all I can say here is... at least he's wearing some kind of a mask! What is that chest 'THING' he's wearing? The designers can't even shape it in to some kind of Muscle chest plate! As I've stated above, I never have been a Stargirl fan, but I really think this must have been the last costume the designers worked on because it sure looks the odd one out! Every other JSA member has some form of leather looking outfit of some description, not that I'm a fan of the leather look, where as this poor actor is given what's basically a 'onesie'! I think we all realise why! Especially after reading half the reactions on other websites! I was really looking forward to the new season of 'Legends' until I saw these images! If these costumes are anything to go by, Please, Please, Please 'CW' do NOT attempt to bring Dr Fate in to the team, because you'll most certainly destroy him too! The Legends travel to Nazi-occupied Paris, but find themselves surrounded by the Justice Society of America (AKA JSA.) The Legends discover a time aberration that threatens the JSA, but the JSA wants nothing to do with them or their help. Nevertheless, the Legends force their way into the JSA’s mission to intercept and seize a mysterious package. Nate is desperate to prove that he should be part of the team, but he has a secret that he shares with his grandfather Commander Steel that might make it difficult. Ray's so focused on impressing the JSA, he puts himself and Vixen in danger. Meanwhile, Stein has stepped in as the leader with Rip gone, but when decisions aren’t being made Sara seems to be the one calling the shots. Do WB know what they have?